Have a machine but unsure how to operate it? 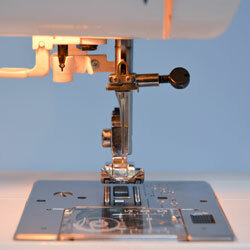 Bring your personal sewing machine in and learn the ins and outs. In this one time course, you will get to know how to use your machine so you can sew at home. Please ensure machine is in good working order and bring in any extra bits and bobs that came with the machine. The studio will supply practice fabric. Sewing machine basics. How to fill a bobbin, thread, trouble shoot and maintain your personal domestic sewing machine. How to sew straight and curved lines. There are no set dates and times for this course. Students need to book above required hours in the studio. Hourly instructional rates found HERE.